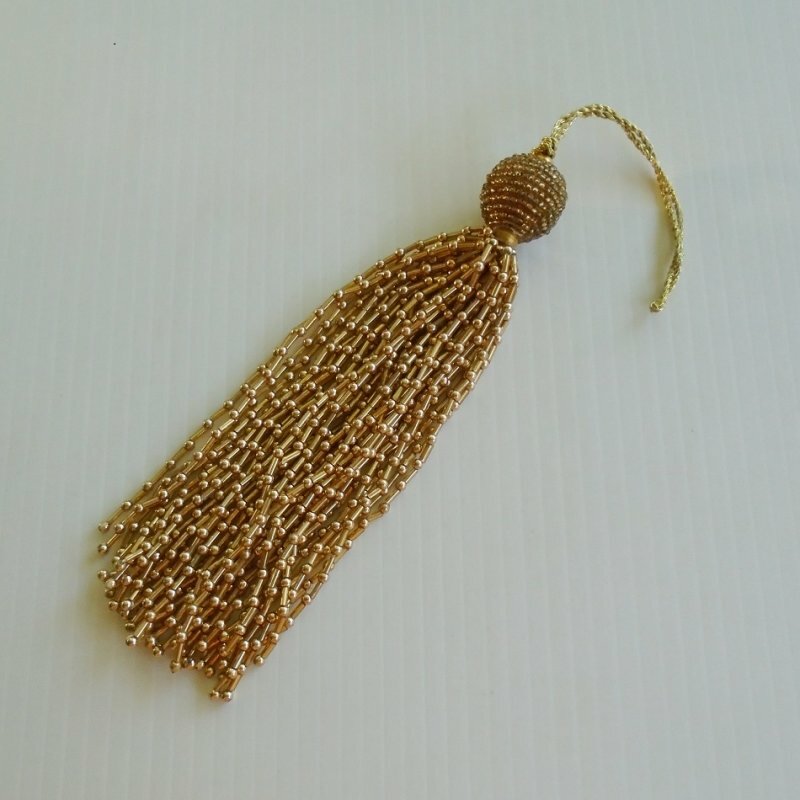 Gold tone tassel pull, 7 inch body with 11 inch overall length. Use for shade pull, zipper pull, purse or suitcase decor, bookmark and other uses. Tassel pulls can add elegance to numerous items. Some of the uses include curtain pulls, shade pulls, ceiling fan pulls, zipper pulls. You can add one to your suitcase for easy identification or to your purse. They can be used for a bookmark or cabinet and drawer pulls. So you see, the various uses are just about anywhere you desire. I have four or five different tassel pulls that I recently acquired at an estate sale. The others will be listed also, but this listing is just for the pull that you see in my photo. The pulls have never been used, but the store tags are gone so I must list them as a used item. When purchased, they were all in their original store bag. It is gold in color. It is made from bugle and ball beads. It is actually a total of 11 inches long. I put the length of 7 inches in my title because the 4 inch hang cord can be knotted to make the pull shorter if desired, but from the top of the upper one inch ball to the bottom of the tassels is 7 inches and that length cannot be shortened. If I counted correctly, there are 38 strings. Delivery will be via USPS First Class Mail Parcel from California. Buyer to pay delivery charges of $4.10.